Home Blog Do I Need An Insulated Garage Door? In the past, insulated garage doors were popular mainly in colder climates. With today’s advanced technology, the benefits are broader. Polystyrene panels that are inserted between an existing door’s steel layers can reduce noise. However, these doors are only slightly more energy efficient than non-insulated. Polyurethane insulation on the other hand, consists of foam injected between a door’s steel layers, which expand to fill the space, and bond to the frame. This type provides a high level of noise and climate control, and contributes both strength and durability. Generally, the noise of a garage door is generated by the opener. Belt-driven openers are the quietest while chain-drive openers tend to be the loudest. With a bit of insulation though, the noise of the operation can be significantly reduced and you'll also be blocking out sounds from the outside. This can be particularly beneficial if for example you use your garage as a workshop – you'll be able to work freely without worrying about disruption to your neighbors. The added insulation improves the overall thermal capacity of the house. In cold climates, the insulation prevents heat from escaping thus reducing the energy and the cost needed to heat up the house. In warmer areas, this will prevent hot air from entering the house, bringing down the cost of air conditioning. The effects of insulation is most pronounced in houses where the garage is either under a bedroom or adjacent to the kitchen or living area. In the garage itself, the temperature of the cars themselves will also remain less affected by the outside climate. Cold temperatures can have a damaging effect on a car, especially in freezing conditions. It can shorten battery life, decrease car tire pressure and thicken fluids. An insulated door can increase the temperature in the garage by as much as 30° to 42°. Similarly, many items typically stored in the garage, such as paint, motor oil, cleaning, and gardening supplies, will also last longer in this milder environment. More questions for us? Just get in touch with our professionals at Garage Door Repair Hercules for the answers you need. 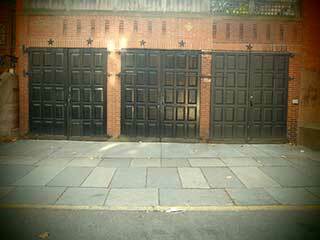 There's a broad array of projects our professional garage door technicians can help you with. Whether you're looking to have a new opener or a new door installed, or you're in need of emergency repair services, we got you covered. Schedule an appointment today using our online booking system. Take a look at the rest of our website to learn more about us and the services we provide. Thank you for choosing Garage Door Repair Hercules! One of our experts will be in touch soon. Feel free to browse our website for FAQ, tips and more useful information in the meantime!